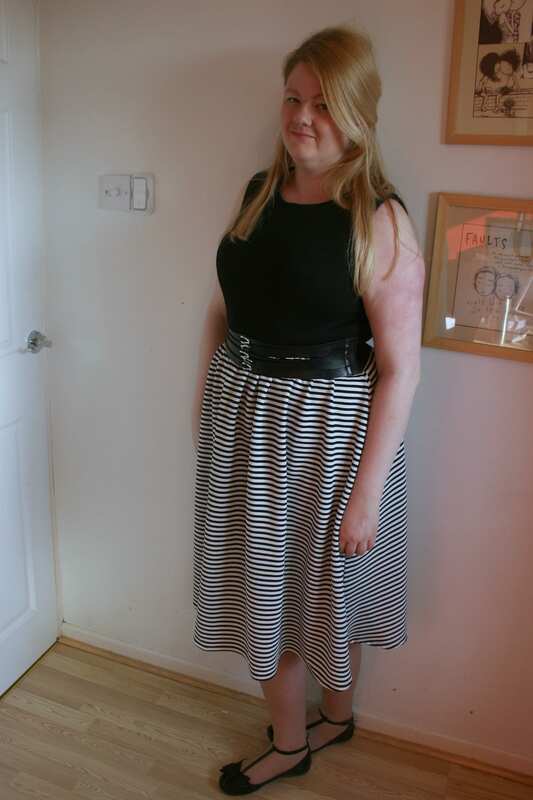 I stalked this dress down on ASOS for a while – by the time I decided I wanted it, it was out of stock in the size I wanted. Thanks to the ASOS mobile site and the saved items bit, it finally popped up in my size and I couldn’t jab buy quick enough! I’m not sure about it though. I love the style, and I love the colours (um, stripes. Whatever) but midi length…the model is only 2 inches taller than me, but I feel so swamped in the skirt. I can’t decide whether I should keep it at this length, or shorten it so it sits just below my knee. Its pretty odd to be saying something needs to be shorter though, I’m usually complaining things aren’t long enough! I wore this dress yesterday to go wedding dress shopping with my friend Ally. Very exciting, as I’ve never been shopping for this kind of dress with anyone before. Unfortunately, I wasn’t able to try on any of the dresses – I have no interest in getting married any time soon, but c’mon, I like dresses. I used to go and try on all the ball gowns in Monsoon in my uni town too often. If I had events and the money, I’d have a whole room dedicated to ball gowns. I still have all my ball gowns from school and uni. To then spend an afternoon watching someone else trying on some beautiful dresses was just torture. The shops were located in Clifton though, which meant a good excuse to take Ally to Lahloo Pantry and Cordial and Grace – both of which I discovered through the #cliftoncakecrawl, which is still one of the most fun Sunday afternoons I’ve had in a long time. This week has been too much about food though – tea and cake yesterday, trying my first bubble tea at HK Diner on Park Street today (verdict: YUM but odd. The little jelly texture balls were an odd thing to get while drinking the creamy strawberry slushie), sushi with Alex on Thursday (Yo! Sushi is having Blue Thursdays as well as the usual Blue Mondays this month, and I can’t turn down eating as much sushi as possible) and yet another epic Fabulous Food Night at Goldbrick House – this month was beef. I went with some of my colleagues, where we were served things like Asian oxtail broth with a crispy wonton, steak tartare (amazing) and little canapes of Yorkshire puddings with roast beef and horseradish cream. I think this week might be a good time to start a diet…! Ooh I like the dress a lot! I am pro a midi, but I bet it would look good if you shortened it to a knee length as well.